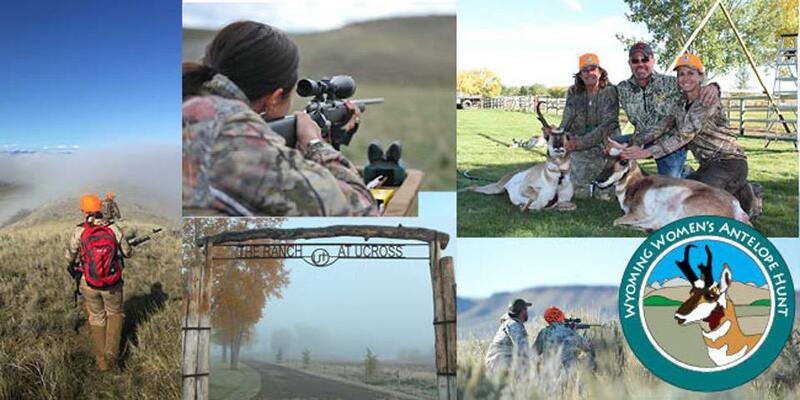 LARAMIE, WY – The Wyoming Women’s Foundation will host its 6th Annual Wyoming Women’s Antelope Hunt Oct. 11 – 14, 2018 at the Ranch at Ucross in northeastern Wyoming. Each year the event hosts women from all over the country through corporate sponsorships, scholarships and individuals. The foundation is seeking sponsors and individual hunters for this year’s event. Based on its level of contribution, each sponsor will have the opportunity to invite women to hunt at the event. Founded in 2013, the country’s first all-women’s antelope hunt works to raise awareness and funds for the foundation’s mission to improve the economic self-sufficiency of Wyoming women. Since inception, the hunt has raised more than $345,000 to help carry out its work and has provided almost 200 hunts and engaged more than 100 partners and sponsors. The hunt honors Wyoming’s traditions and culture by teaching women how to harvest, process and cook game meat. The event provides personal growth to participants through a focus on mentoring and developing camaraderie between women. Additionally, women go home with the skills to provide nutritious food to their families. Experienced hunters act as mentors and share their knowledge, experience and passion for hunting with a new or less experienced hunter. Each pair hunts with a guide. Hunters of all experience levels are welcome. The weekend includes a fundraising auction dinner open to the public. The dinner will take place at the Ranch at Ucross on Friday, Oct. 12. State and local officials often attend the dinner in support of the event and the foundation. Tickets and dinner table sponsorships are available on the hunt website. The foundation is also seeking in-kind donations for the auction dinner on Oct. 12. Please visit wyomingwomensantelopehunt.org and click on “participate” for more information on full event or dinner sponsorship and individual participation, including scholarships. The hunt expects to host 50 hunters in 2018. The Wyoming Women’s Foundation is a priority fund of the Wyoming Community Foundation, which granted out over $6 million to nonprofits across the state in 2016. The Women’s Foundation builds on a permanent endowment that will ensure funding to enhance the lives of women and girls in Wyoming for generations to come. It makes grants to organizations that help Wyoming women and girls attain economic self-sufficiency, creates statewide awareness of the barriers to economic self-sufficiency, and supports systems change to eliminate those barriers. Since its inception in 1999, the foundation has invested more than $832,000 into almost 100 organizations.